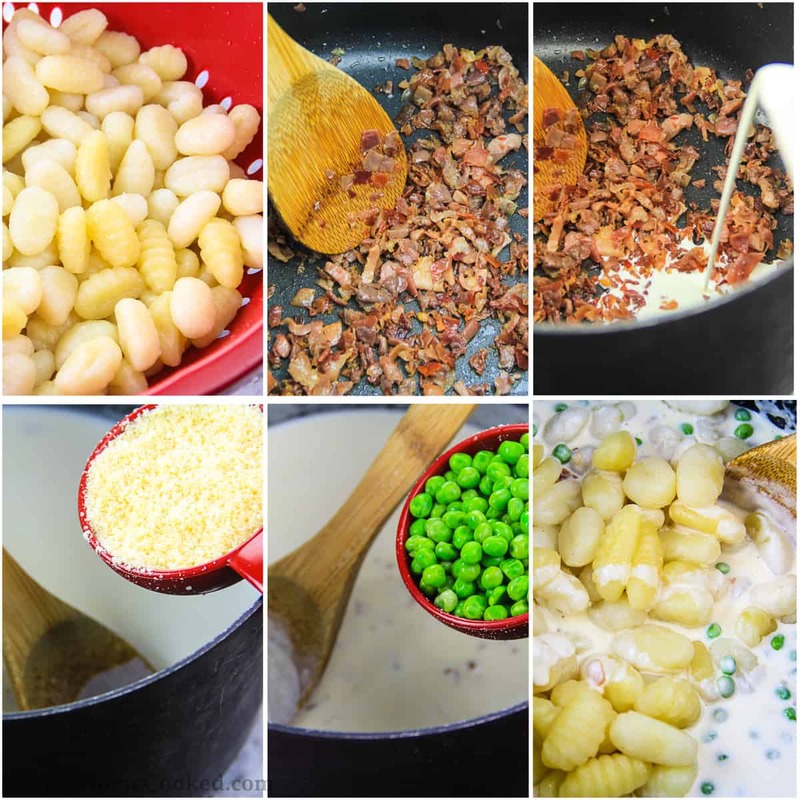 This Potato Gnocchi Recipe includes a delicious homemade Parmesan cream sauce with pops of flavor from prosciutto that will delight your taste buds! For a bit lighter spin on gnocchi, you can make a batch of our Copycat Chicken Gnocchi Soup! This recipe was originally posted September 9, 2015, we’ve tweaked it a bit since then. This post may contain affiliate links. Read my disclosure policy here. 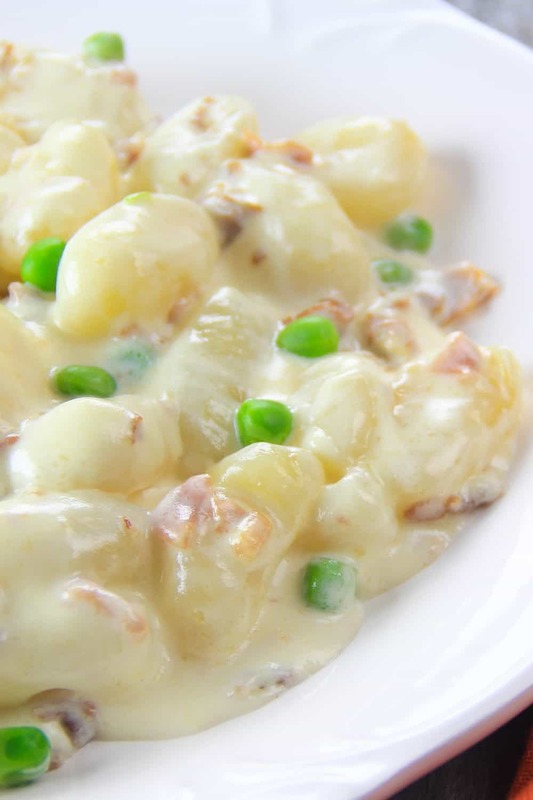 This potato gnocchi recipe with prosciutto and a homemade Parmesan cream sauce is the ultimate meal for busy weeknights. With only 5 ingredients and 20 minutes of cook time, this dish can be quite a lifesaver. The prosciutto adds such a strong smoky flavor to the dish. The heavy cream and parmesan paired with the potato gnocchi taste as if you’re eating Alfredo. Since gnocchi cooks faster than pasta, this dish is perfect for those quick fix dinners. Cook the potato gnocchi according to the package directions and set aside. Prepare your prosciutto by cooking until crisp in a skillet, then follow directions in the printable recipe below for adding in the cream and cheese to create a smooth creamy sauce. 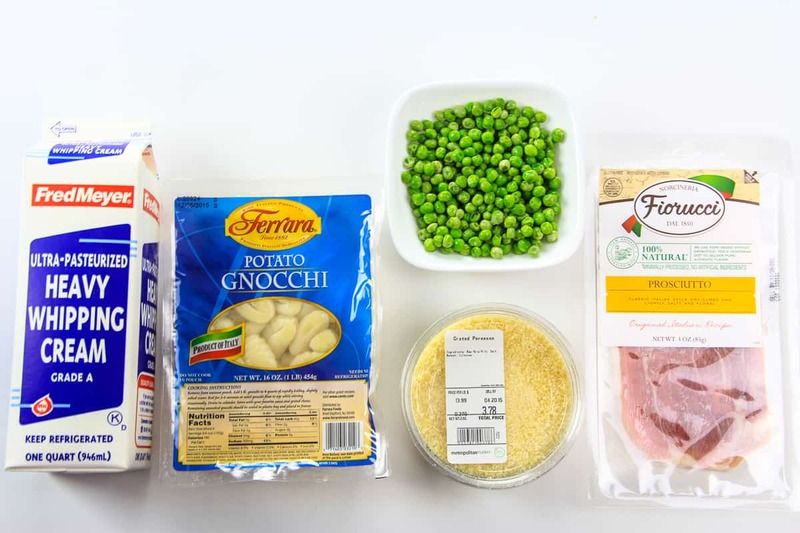 Your last steps will be adding back in the gnocchi and peas to simmer and thicken the sauce before serving. 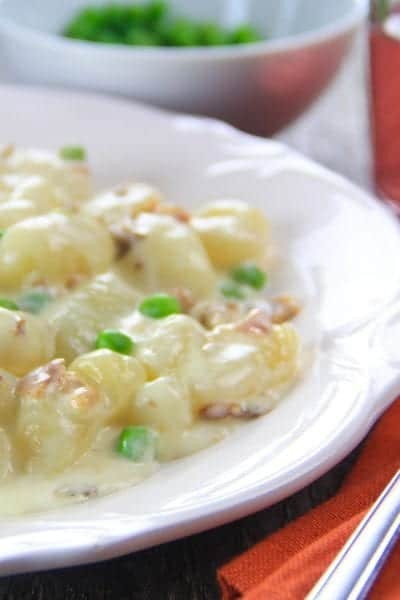 This rich potato gnocchi recipe will become a favorite in your family menu for the fast meal preparation and classic flavors. If this potato gnocchi recipe isn’t the pasta dish you are looking for this week, I have plenty of others to share. Pasta is a favorite go-to meal on busy evenings since it can so often be either fast to make or a great make-ahead meal. Keeping ingredients on hand for these dishes is a must in my grocery plan. I know I can grab a few things and whip up a meal that everyone loves in just minutes. Cook the potato gnocchi according to the package, drain, and set aside. Chop the prosciutto and place it into a pot over medium high heat. Cook for about 4-5 minutes or until crispy. Then add the heavy whipping cream. Once the heavy cream has heated, add the grated parmesan and stir until it has melted (about 6 minutes). Add the peas and cooked gnocchi and cook for another 5 minutes. Do you put frozen peas in or would they give off too much liquid? Or is it best to use canned? I used frozen peas that were thawed. They didn’t have too much liquid.